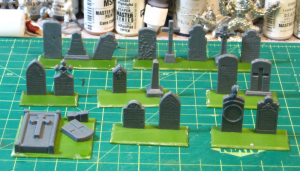 Quick photo of my work-in-progress Renedra gravestones, purchased over Christmas from J&M Miniatures. The bases are leftovers from my long-neglected English Civil War/Thirty Years War forces, which are Warlord sets and come to think of it, also cast by Renedra. Quick and rough late night snapshot of half the Renedra graves. Click for slightly larger. This is half (one of two identical sprues) of the Renedra gravestone set, and spread out to allow figures between the bases, it comfortably fills my 11″x9″ cutting matt. Adding the second sprue and some other bits like trees and such would give you an extensive graveyard to skulk in!